So today I received an email from a Lionel Train store in Mountain Lakes, NJ called The Train Station. My father gave me his set of Lionel trains so I decided to clean them up, buy some new track, and get the engine repaired. The closest train store was the one referenced above and I drove about 35 minutes to get there. It is by the actual train station in Mountain Lakes. It is also the site of Bobby Baccala's death in The Sopranos and the store is awesome. Wall to wall trains, engine, accessories, and an extremely helpful staff who spent a ton of time with me. So much so that instead of just waiting for my father's engine to get repaired, I bought another one just so the kids and I can test out our new track and cleaned up cars. Paid Search Ads - This is an absolute no brainer assuming The Train Station has some advertising dollars to spend. Since the promotion is available for anyone and not just local residents, open it up to anyone searching on the internet. Start out small with a few hundred keywords that are well organized because there is a lot of competition already for typical words. Use the 10% off promotion in the text ad copy and have at it. If you don't have enough dollars for a national campaign , geo target it. Google Content - If possible I'd like to have some standard banner ads with the promotion, but if not that's ok just use your text ads. 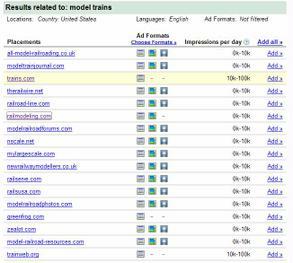 Go into Google and search for sites that specialize in model trains and pick the ones you want to run on or if that's too expensive go off the keywords. Blog Advertising - Now you can try going to BlogAds looking for hobbyist sites and then run some ads on it or you can try searching blogs on Google or Technorati (you remember that) and contact the blog owners to see if they'd write a post for you. Or you could leave comments on a blogs, but before I'd do that I'd send a note to the blog owner so they realize you aren't spamming their comments. The Website - The site does pretty much what you need it to do including offering eCommerce. It does everything except give people reasons to continue to check back in often. So what can you do? Let's assume you don't have enough time for a blog, but how about video? Grab a cam corder and create your own track layouts. How about how to clean cars? You could simply record a conversation with customers. The content is endless and other than editing and figuring out your "video show" it will cost nothing. Start a channel on YouTube and start promoting your store and promotions. This will help you generate traffic to your eCommerce site. You could host the videos on your site or just link to your YouTube channel. That's it for now. Happy train collecting.